To provide a Junior Showmanship Scholarship in the amount of $800.00 on an annual basis. Recipients must be dependents of an Akita Club of America member and meet the eligibility requirements as stipulated in order to apply. This Program will be in effect only during the years when funds have been made available. One Scholarship recipient may be selected annually, for a one (1) time Award of $800.00. 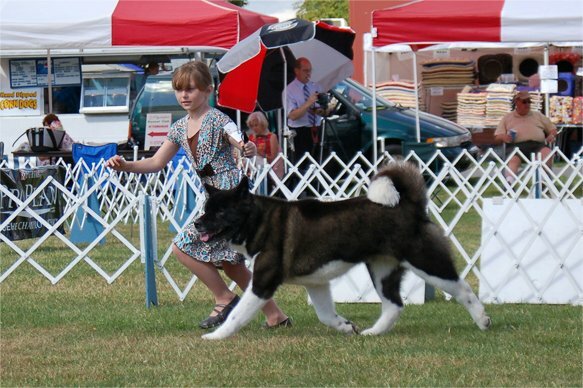 The Award is available to junior handlers whose parent or legal guardian is a current member of the Akita Club of America. Applicants must be in their senior year of high school, with a minimum 3.0 overall GPA, won at least 2 Best Junior Showmanship awards handling an Akita, and be enrolling in a four (4) year university or a two (2) year community college degree program. Funds for the scholarship winner will be paid out in September of the award year, pending receipt to ACA of proof of enrollment. First consideration will be given to full time students. If no full time students apply or meet the requirements stated in 1 and 2 above, the award may be given to a part time student. At least one of the applicant's parent or legal guardian must be a member of ACA. Applicant must be in the senior year of high school when applying. Applicant must have earned a minimum of 3.0 overall GPA while in high school. Applicant must provide proof of having earned at least two (2) Best Junior Showmanship awards with his/her Akita. Applicant must submit a 500 word essay, which will be graded on content and level of writing skills. Essay must be typed, doubled spaced, 12 point font, with one (1) inch margins. The winning applicants essay will be printed in the ACA Update. Applicant must provide a cover sheet with the essay listing the junior handler's name, address, phone number, and name of parents/legal guardian who is an ACA member and enclose all various proofs of eligibility as stated above. State reasons why you feel that you are a good candidate for this award (i.e., future showmanship goals, breed knowledge, etc.). What benefits have you obtained from becoming a junior handler? What advice would you give to new junior handlers who are just starting out? Provides a Junior Showmanship Scholarship in the amount of $800.00 on an annual basis. Read More!